Donors in the United States may not give directly to Indian nonprofits and receive a tax deduction in the US. By giving through CAF America, US donors can make tax effective donations to any successfully vetted foreign charitable organization. Giving to a foreign nonprofit without conducting due diligence on the organization and its staff is a risk for any donor. 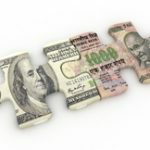 India has close to 3 million nonprofits according to some estimates, but only a small percentage can legally receive foreign funding under India’s Foreign Contributions Regulation Act (FCRA). Giving to a non-FCRA compliant organization or to a non-FCRA account is a legal risk for the recipient organization and a reputational risk for the donor. There are 3 forms of nonprofits in India: Public Charitable Trusts, Societies, and Section 8 Companies; to work with nonprofits in India, grantmakers should be familiar with each form. CAF America can currently expedite grants to more than 200 FCRA-compliant and vetted nonprofits. We can conduct due diligence on any FCRA-registered nonprofit and make grants to these organizations if they pass our vetting process. 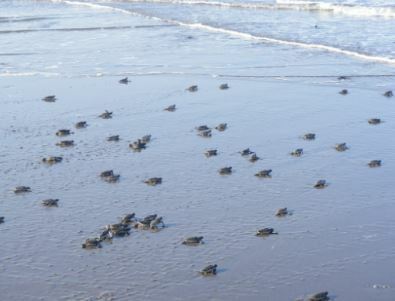 Thinking of making a charitable donation to a nonprofit in India? While the country is home to the most nonprofits in the world, giving to India can be complicated even for experienced grantmakers. One of the fastest–growing countries in the world, India is home to more than 1.3 billion people, though it is estimated that approximately 270 million Indians live in poverty. These significant levels of poverty may account for the presence of an estimated 3 million nonprofits operating in the country. This robust nonprofit sector, combined with the presence of a thriving Indian diaspora community in the US are a driving force behind cross-border giving to India. However, the best avenues to do so are not always clear. American citizens who want to support charitable initiatives in India and receive a tax-deduction have a few options to consider: they may donate to a US-based nonprofit which has programs in India, a “friends of” organization which supports an Indian nonprofit, or use an intermediary grantmaker (such as CAF America) to tax-effectively support the organizations and causes they value. To learn more about mechanisms for international grantmaking, see Chapter Four of Cross-Border Giving: A Legal and Practical Guide (Charity Channel Press, 2018). United States law requires that foreign charitable organizations, such as those operating in India, undergo extensive due diligence (either an expenditure responsibility or an equivalency determination) to establish whether donations to these organizations can be tax-deductible or to ensure that they are not taxable expenditures for 501(c)(3) grantors. As the leader in international grantmaking, CAF America maintains unparalleled knowledge of US and recipient country regulations governing cross-border giving and the receipt of foreign funding. We have found it to be useful to share this information with our donors so they too can be aware of the challenges that their preferred organization faces on-the-ground. 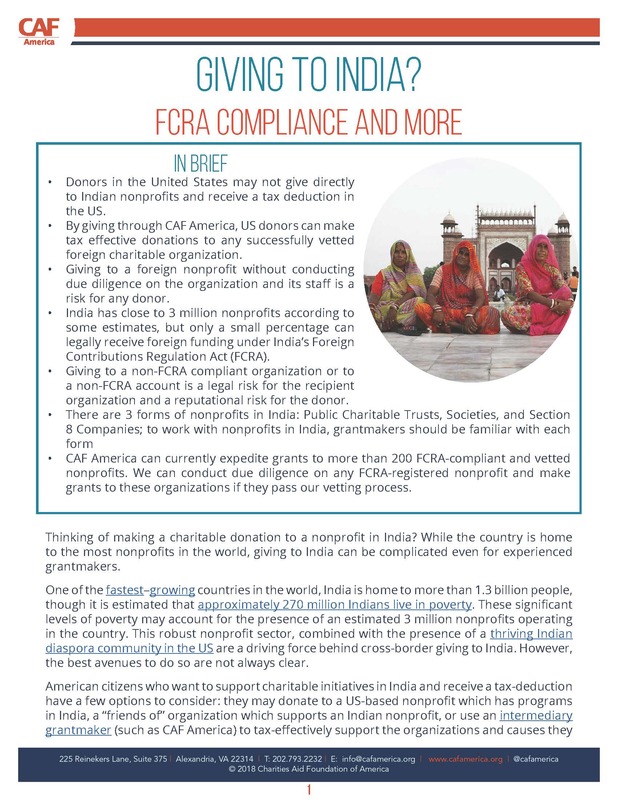 Only a small percentage of Indian charities are legally able to receive foreign funding under the Foreign Contributions Regulation Act (FCRA). Under FCRA, which was tightened and revised in 2010, Indian nonprofits of all shapes and sizes must register with the federal government to legally receive foreign funding. FCRA was designed “to regulate the acceptance and utilisation of foreign contribution or foreign hospitality … and to prohibit acceptance and utilisation of foreign contribution or foreign hospitality for any activities detrimental to the national interest…”. Unfortunately, FCRA status is tenuous, with charities having licenses revoked and bank accounts frozen in recent years. The International Center for Not-for-profit Law (ICNL) estimates that only about 29,000 nonprofits are registered under FCRA. Since 2010, it has become more difficult for organizations to receive FCRA status if they do not already have it. Beyond the FCRA registration, it’s important to note that India’s impressive nonprofit sector includes, according to certain estimates, more than a million operational nonprofits that are not registered at all with the government. Given this expansive and complex nonprofit landscape, as well as the need to navigate the rules and regulations of both donor and recipient jurisdictions, as a donor and/or grantmaker, it’s vital to have a comprehensive understanding of the local context, as well as the requirements and conditions impacting cross-border giving to India. 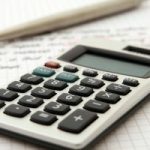 Ensuring that your gift is made in full compliance with all relevant laws, and also doing your due diligence on the nonprofit, will help provide peace of mind that your gift was made to the correct organization, that it was actually received by the organization, and that it will be used for its intended purposes. Within the context of cross-border giving, US grantmakers are required to conduct either an equivalency Determination – ED (a substantial process to evaluate whether the foreign organization would qualify as an equivalent of a US 501(c)(3) organization) or an expenditure responsibility – ER (a process ensuring that the granted funds will be used for exclusively charitable purposes, in which case the review is focused on the charitable project and a “pre-grant inquiry” about the organization conducting the project). Moreover, for cross-border grants to be legally compliant, tax-effective, safe, and in-line with best practices, the vetting process on the recipient organization should extend to reviewing compliance with anti-money laundering and counter-terrorist financing regulations. Whether conducting ED or ER, vetting requires an understanding of the legal and financial status, organizational structure, and governance of the organization. As such, it is essential to be aware of the available legal structures for charitable entities under local laws. Public Charitable Trusts can be established for purposes such as poverty relief, education, medical relief, or for other public utility purpose. Public Charitable Trusts are regulated on state level, as federal law governs only private trusts (the Indian Trusts Act of 1882). The key difference between a private and public trust is whether the beneficiary population is a substantial segment of the population (i.e. serving the public). Societies are membership organizations that can be registered for charitable purposes and are regulated by the Societies Registration Act (1860). Section 8 Companies: These are limited or private limited companies governed under the federal Companies Act (2013), which are committed to promoting commerce, art, science, sports, education, research, social welfare, religion, charity, protection of environment or any such other object. Any profits or income of section 8 companies must be used exclusively to further these purposes, its members being precluded from receiving dividends. When considering whether ED or ER is a better fit for a particular grant or grantee in India, grantmakers should be well-acquainted with these three types of nonprofit organizations. Furthermore, since state regulations play an important role in governing nonprofits, some of the aspects grantmakers verify during the course of the due diligence process—such as dissolution, permitted activities etc.—may in fact be covered by state law. Endowment support and the interest earned on such investments are also considered foreign contributions. Even direct donations—which do not allow for a tax-deduction in the US— to an Indian nonprofit made by an Indian citizen living in the US are considered foreign contributions if the individual has become a citizen of a foreign country. To gain (and maintain) FCRA registration, Indian nonprofits must file a form FC-3 and a) register with the Central Government; b) agree to accept contributions through designated banks; and c) maintain separate books of accounts with regard to all receipts and disbursements of funds. Additionally, the nonprofit must renew their registration every five years and post quarterly reports regarding the receipt of foreign contributions on their own website or the Ministry of Home Affairs (MHA). Annual reports, form FC-4, must also be submitted to the Ministry. the manner in which it was used. The number of FCRA-compliant nonprofits is constantly in flux. Between 2011-2015, the Indian government canceled approximately 20,000 FCRA licences. Since 2015, FCRA registration and reporting has moved entirely online. While this was welcomed by the Indian nonprofit sector, it also increased the requirements for reporting. Now every foreign contribution must be publicly reported, whereas previously only contributions in excess of $146,000 were affected by this requirement. Additionally banks must now also report to MHA all foreign contributions that an individual or organization receives within 48 hours. Lastly, annual returns must be filed (form FC-4), along with confirmation that the nonprofit has “not used foreign funds for activities that are likely to prejudicially affect the sovereignty and integrity of the country, the security, strategic, scientific, and economic interests of the State and the public interest”. This latest modification raises concerns for many organizations. As donors may expect, the broad language used in this section allows for a broad interpretation of this requirement. In practice, it is very likely to inhibit the use of foreign funding for human rights issues, legal rights, policy, governance, electoral reform, and other sensitive issues. Watch Listing of Donors: On the 16th of June 2016, the government canceled the registration of NGO Sabrang Trust, an organization run by civil rights activist Teesta Setalvad, after receiving funding from the US-based Ford Foundation. Ford Foundation was put on a “watch-list” by the Ministry of Home Affairs following a Gujarat government complaint that it was “interfering in India’s internal affairs” and “promoting communal disharmony” through engagement with Sabrang Trust. According to data from May 2016, the Ministry of Home Affairs had put eighteen major foreign donors on this watch list. While it appears that in some cases the proper procedures under FCRA were not followed, these examples also provide insight on how the Indian nonprofit, as well as the foreign donor need to be aware of these regulations and how they may affect their activities in India. Harming the Recipient nonprofit: An Indian nonprofit that attempts to receive foreign funding without FCRA status is committing a serious offense under Indian law, likely resulting in the closure of the nonprofit and a significant warning to the foreign donor. However, even if a nonprofit is in good standing with the FCRA, foreign funding can come under strict scrutiny and the organization may face suspension or cancellation of its FCRA status if requirements are not met. This statement from the Supreme Court indicates that FCRA will increasingly be relied upon by the authorities in an effort to ensure compliance of the nonprofit sector with the strict requirements of Indian Law. Only time will tell how India’s nonprofit sector will evolve and how these latest developments on the regulatory arena will impact the capacity of Indian nonprofits to receive foreign funding. What we can do, based on the lessons learned in India and other jurisdictions, is to assert that the key to supporting Indian nonprofits in the future lies in the grantmakers’ thorough knowledge of the requirements impacting foreign charitable donations and the commitment to a regulatory compliant grantmaking. How Can CAF America Help? CAF America has made more than 1,400 grants totaling nearly $7 million dollars to FCRA-registered nonprofits in India within the past 5 years. We maintain full legal compliance with Indian laws and work with our partner office, CAF India, to keep abreast of the ever-changing regulatory environment impacting Indian nonprofits. CAF America can expedite grants to 200+ Indian charities within a week. From the Field: Beyond our focus on regulatory compliance, more recently, we have been working with our grantees in India to combat credit card fraud. We became aware of a new practice where individuals posing as professional fundraisers offered to run fundraising campaigns in the US or globally for Indian nonprofits. Organizations looking to identify a solution for expanding their fundraising across borders should proceed carefully, as often times these individuals create the appearance of a legitimate campaign. Contact CAF America at info@cafamerica.org to learn more about this issue.